At the heart of Ava DuVernay’s stirring Martin Luther King biopic is a central performance that has unsurprisingly dominated the critical spotlight. David Oyelowo’s portrayal rightfully deserves all acclaim. But to focus on him alone threatens to depict it as one-man show, and overlook a quality ensemble cast that cements it as one of the year’s most satisfying pictures. ‘Biopic’ is not even the appropriate label, for this is not the unexpurgated cradle-to-grave history that could be expected – which Hollywood, surprisingly, is yet to produce. Selma instead concentrates on the few short months of 1965 that saw public marches demanding equal voting rights in Alabama. As well as giving these momentous events the import they deserve, to focus on a short period in detail is arguably a more potent way of revealing the depths of King’s character than might be achieved in a necessarily truncated full life pic. 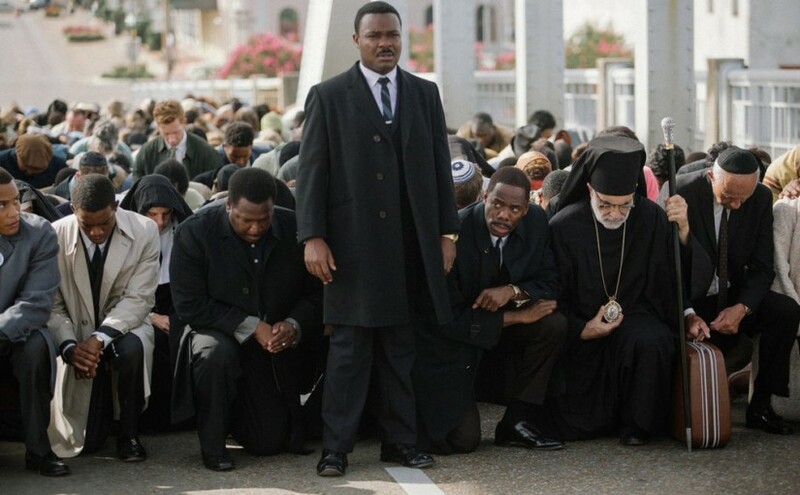 Oyelowo’s mesmerising performance understands that the only really successful way to capture the charisma of Martin Luther King is to be equally charismatic. Attempting a direct impression would always fall short. We, the viewers, are placed among his disaffected congregation, and, emphasised by that viewpoint, his speeches are just as passionately delivered, just as motivating by result. Tom Wilkinson’s turn as Lyndon B. Johnson has been overshadowed (naturally, with considerably less screen time) but it is one of poise and complexity. He reflects the President’s need to carefully balance his sympathy for King’s cause with his entrenched position as chief of state. The dominant white hegemony he heads up is personified by Tim Roth in fantastically oily, sneering form, as unapologetic supremacist Governor Wallace. And beyond this central trio, of British talent incidentally, is a cast of the firmest foundations. As the civil rights movement’s figurehead, King was supported by a team of tireless devotees. In parallel, Oyelowo’s performance is founded on a host of invariably solid acting turns. Carmen Ejogo plays his wife, Giovanni Ribisi is the President’s right hand man, while Oprah Winfrey, Common, and The Wire’s Wendell Pierce all feature. The result is a picture of rare heft and integrity. The marches across the Edmund Pettus Bridge form the focal moments. King’s protesters defiantly return to the scene after the unprovoked bloodshed of the initial clash, and the film revisits the same real-life location to depict the brutality in harrowing, shocking detail. The clear and tangible goal of the demonstrators offers potential for a deeply satisfying plot conclusion. But the most moving individual storyline might be that of Cager Lee. Having lost his grandson Jimmie Lee Jackson in the first outbreak of violence he marches for his right to vote at the age of eighty-four. He lived through a period where, from today’s perspective, it is most shocking to confront how banal, how embedded, how understood as ‘the natural order of things’ racism was. It is a double-edged illumination that we have, thanks to activists like King, advanced so far since that time. It also throws into sharp relief the repugnance of any racist behaviour we are still forced to confront to this day. On the very date I saw Selma, the news reports that a group of football fans have pushed a black commuter off a Paris metro train while chanting racist slogans. Cager Lee would have been ashamed.